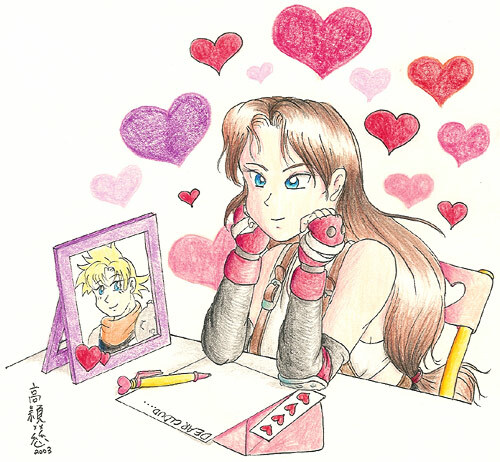 Lowena's not just a fan of Capcom and SNK. Like me, she's really curious and interested in all sortsa stuff. This gallery is for all the random fanart that doesn't fit into any of the other galleries. 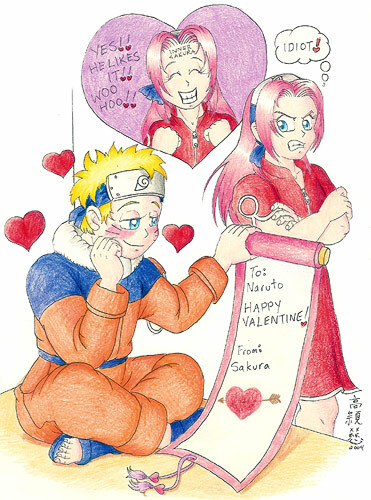 This is Naruto's dream Valentine's Day. BTW, if you haven't checked out Naruto yet, you should because it's a great comic! Aww... kids are so cute! Who'd think that this cute little girl and that nice little puppy would grow up to be such great fighters? 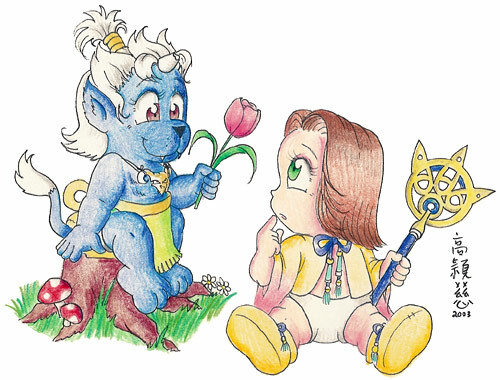 Here are some possible endings: "...why wasn't I in Kingdom Hearts too?" "...will Square ever re-make Final Fantasy 7" "... is there a chance that FF7 well get a sequel like FFX?" Here's the picture from one of Lowena's envelopes. 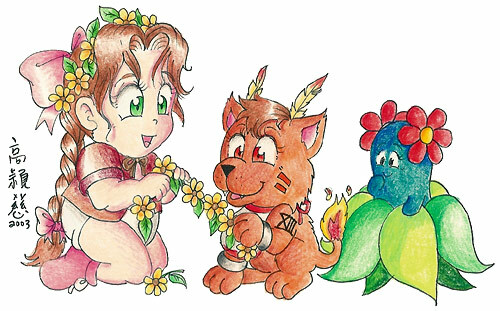 She always draws something interesting. The lady who delivers my mail always enjoys the pictures too! 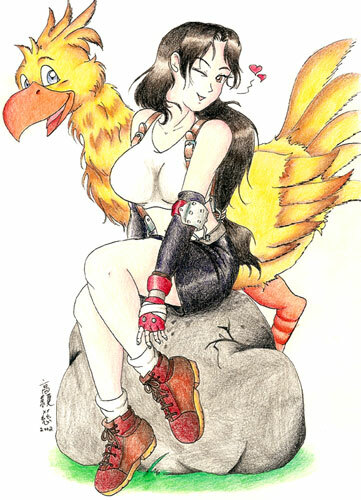 Two of my favorite characters of all-time... Tifa from Final Fantasy 7, and the Chocobo from all the FF games. I've got collections going for both of these two, and now I've got a great picture too! 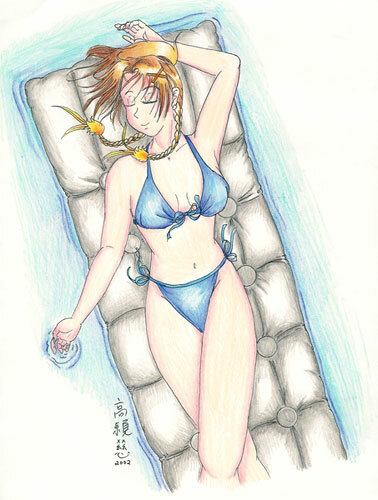 I don't blame Tidus at all for staring. And Kimahri, I respect you for trying not to notice. How're you gonna react...? I don't think I could have imagined Lulu in anything other than a gloomy outfit, but this orange suit look good on her. Here's Yuri Sakazaki with Vice & Mature, chowing down on some watermelons. In the USA, there's a stereotype about black people loving watermelons, but let me tell you that NOBODY loves to eat watermelons more than the Japanese. As usual, when Lowena mailed me her batch of Summer Gals 2001 pictures, she drew this interesting little sketch on the front of the envelope. And this time, Lowena sketched a little something on back too.